People’s Daily Online also noted the explosive growth in China’s private gold investment market. In the first three quarters, the individual customers in Shanghai Gold Exchanges neared 1.6 million; gold trade exceeded 4,600 tons and its turnover topped 1.1 trillion Yuan, both rising sharply. That means Chinese has traded more gold than the total global identifiable demand (about 3,201 tons) over the first nine months of the year. Well, let me set the record straight here. The Chinese, like many other Asian countries, have a tradition of reserving and investing in gold for thousands of years. Gold and real estate are typically the top two investment choices mainly due to a distrust of paper instruments resulting from much turmoil throughout the region’s history. What’s more telling is that according to People’s Daily Online, in August, six China ministries, including the People’s Bank of China, and the China Securities Regulatory Commission, jointly issued a notice to promote the gold market and positively connected the future development of the gold market with the competitiveness of financial markets. China is already the world’s top gold producer, but has remained somewhat muted in the global gold market. Now, with the expanding of the Chinese gold market (China just approved its first gold mutual fund on Nov. 29), the increasing investment demand from the Chinese government and / or individual investors will become a major force influencing the world gold market. Now, let’s take a look at the Euro. According to data from the Bank for International Settlements (BIS), German and French banks have the largest debt exposure to Ireland and the southern rim of euro zone in the second quarter–so, the European debt crisis most likely will not evolve into a global contagion as many have feared. Nevertheless, due to the single currency union’s inherent structural weakness, EU has not been able to agree on any meaningful system-wide measures to combat the debt crisis. As such, EU’s country-by-country, crisis-by-crisis approach is only adding market volatility, and further derailing the region. And not even China’s pledge of its $2.7trillion overseas investment fund as European debt rescue could thwart market’s pessimism about the euro. 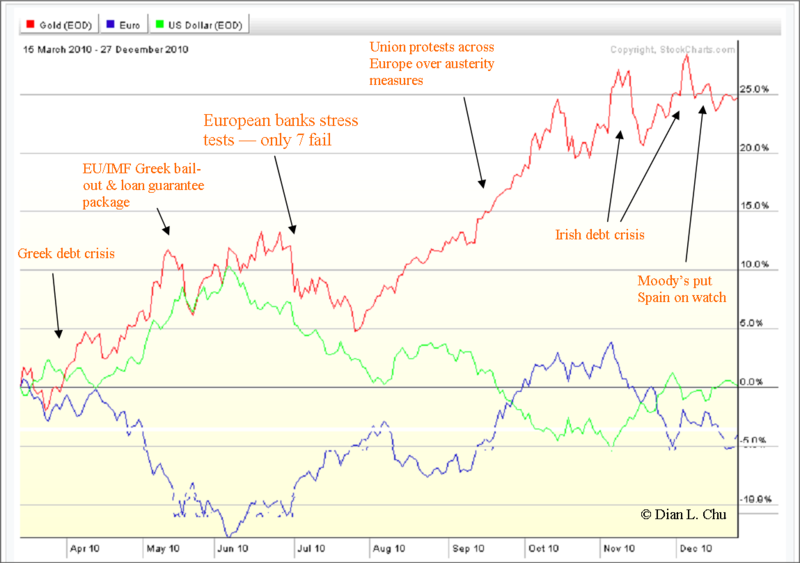 Spain – Too Big To Bail? Multiple rating agencies already put Portugal, Spain and Greece on future downgrade watch, while Italy is another highly indebted euro member persistently coming up in market chatters. Deutsche Bank AG has pegged Portugal as the next seeking a bailout after Greece and Ireland, while Spain is a hidden debt bomb dubbed as “too big to bail” since the size of Spain’s economy (about $1.4 trillion, with 20% jobless rate) is twice that of Greece, Ireland and Portugal combined. Moody’s estimated Spain may have to raise €170 billion from the markets next year, not including the amount banks may need to recapitalize. Bank of England, meanwhile, is not instilling much confidence either by forecasting a possible return to recession in 2011, adding that further quantitative easing may be used, if an “external shock” hits the economy. 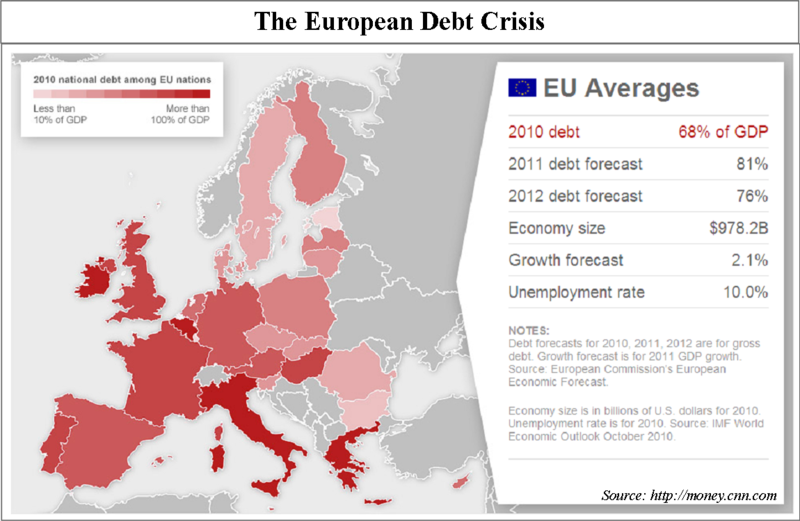 All this is not to say other EU members are in good financial and fiscal fitness either (See Graph). So, if you think the series of down-grades and rising concerns on euro zone countries’ debt has worked against the euro this year, expect a fresh new round of downgrades–over debt or growth prospect—to bring about a full-on assault on Euro next year, particularly when you see Spain come up in headlines. Trouble in Euro should boost Gold while providing support to the Dollar (i.e. the dog with fewer fleas. ), which is the scenario that would play out in 2011. Inflation is already running rampant in countries like China, Russia and India, mostly driven by food shortages. In Beijing, for example, food costs soared nearly 12% year-on-year in November. Now, on the heel of U.S. Federal Reserve’s QE2 announcement in Nov, more monetary easing could be expected from central banks to stimulate their economies in 2011. This will only add fuel to the fire of the growing anxiety over rising inflation, and again bode well for gold. The shiny yellow metal is headed for a 10th straight annual gain. But with excess liquidity distorting everything, the typical trend and regression analysis will not work any more. Nonetheless, combining the fundamental factors discussed here and technical signals, I believe Euro could break below $1.25 or even $1.20 sometimes next year, and could be as early as the first half. This could drive gold upwards towards the $1,600 levels. U.S. Dollar and Treasury would gain support as safe haven, which could push the bond yield down. Furthermore, it is worth noting that Gold priced in Euros has risen more than 38% so far in 2010, reaching a new record high above €34,475 per kilo, far outpacing the Gold’s nominal price gain (in dollar) of around 28%. So, in a way, gold is treated almost like a second reserve currency replacing the Euro, and you would have gotten a better return getting into gold via Euro. Source: Dian Chu, Economic Forecasts and Opinions, December 29, 2010.